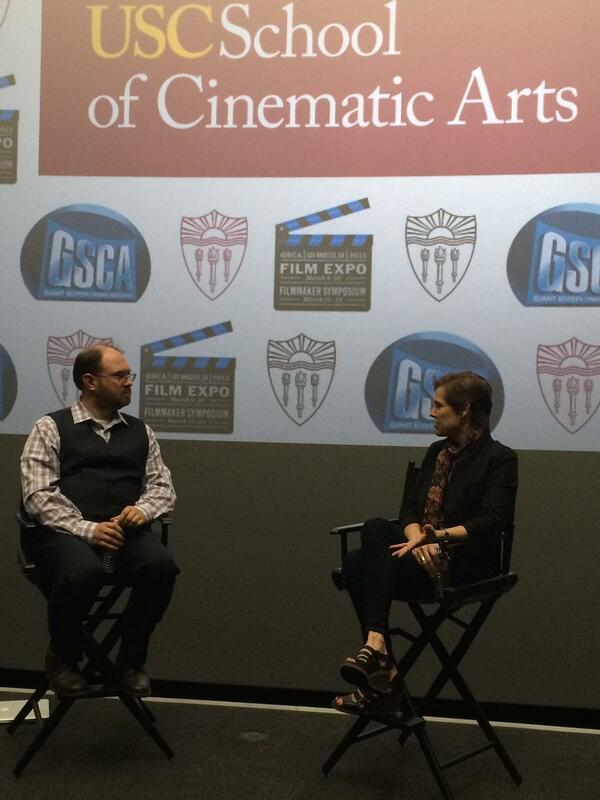 USC School of Cinematic Arts held the IMAX Filmmaker Screening Series on March 8 2015, presented by the Giant Screen Cinema Association (GSCA). It was the first major screening for cinema students in our new Michelle & Kevin Douglas IMAX Theater and Immersive Lab in the Robert Zemeckis Center. The Giant Screen Cinema Association (GSCA) screened three films followed by conversations with filmmakers and industry leaders. The screenings were a great opportunity for cinema students to learn more about telling stories for the giant screen. Sea Monsters: A Prehistoric Adventure Movie opened the event. Featuring “ultra realistic 3-D computer animation, we travel back to the Late Cretaceous, when the sea was dominated by giant marine reptiles, some as large as present-day whales.” The film has won numerous accolades and awards for its animation and is directed by SCA alum Sean MacLeod Phillips. A Q&A with its producer Lisa Truit, a graduate of the SCA Peter Stark Producing Program followed the feature. The second feature of the evening was To the Arctic 3D, a tale of survival, featuring a family of polar bears. The film begins with stunning views of the Artic combined with Paul McCartney singing “Because.” From there, it builds with strong, sparse storytelling performed in voice over by Meryl Streep. This film masters the art of tension, as we watch a mother polar bear risk her life to protect her children from predators. In this case, the unexpected predators are male polar bears, starving because of the melting glaciers. The film was followed by a Q & A with producer Shaun MacGillivray (SCA Alumnus, MFA ’05). The final film of the evening, Flight of the Butterflies 3D, stunningly captures the migration of butterflies as they travel across America into Mexico, and a scientist’s forty year-search for the monarch’s secret hideaway. Writer/ producer Wendy MacKeigan created compelling interwoven storylines that push the barriers of IMAX storytelling. This was followed by a Q & A withJonathan Barker and Co-Executive Producer Wendy MacKeigan. Filmmakers discussed everything from the technicalities of telling stories for various exhibition formats, to film financing, to forging careers in various aspects of IMAX filmmaking. Producer Lisa Truit explained some of the thinking and marketing behind Sea Monsters, which was largely aimed at museum audiences. She spoke on the importance of framing the story for the audience, which, in this case, is largely for families. 25-35% of their revenue stems from school groups; thus, making films valuable educational experiences is key. And telling stories that entertain as they educate is equally integral. Finding ways to make science entertaining can be challenging. Filmmakers spoke of the need to meet the standards of non-fiction, but inject storytelling and entertainment that sells tickets and gets viewers into seats. Producer Lisa Truit encouraged filmmakers to think smart when they are building science-based stories, engaging scientists in the conversation from day one. They will tell you immediately whether your story is possible. This keeps filmmakers from wasting time and money chasing impossible narratives. When Lisa Truit produced Sea Monsters, she collaborated with scientists, combing the fossil records and looking at the probability of various creatures living in the same place at the same time. Once they had established a plausible set of circumstances, they wove a story based on those facts. In this way, they developed an educational story, but outside the bounds of a “classic” documentary. And the scientists were involved throughout the process, from storyboard to animation. An aspect of filmmaking that many of the panelists addressed was financing. Many of these films were at least partially funded from National Science Foundation grants. But as Lisa Truit will attest, that is no easy accomplishment. The process of applying for one of those grants is approximately six months long, and rigorous. Producer and SCA alum Shaun MacGillivray recommended students take classes in film financing and producing while at USC. SCA alum filmmakers encouraged students to follow their paths and become the next filmmakers telling stories using the IMAX platform. Making films for the giant screen requires intense technical expertise and training. They, therefore, recommend students find mentors to help make a transition into this medium of filmmaking. SCA alum Shaun MacGillivray from MacGillivry Freeman Films said that his company is always looking for interns. All the filmmakers recognized how important it is to have new voices in this new form of storytelling. Hopefully this event will encourage new talent to tell their stories over the giant screen.